Custom Formulate Your Own Blend or Private Label? Which One Should You Do? It’s a common question we get asked a lot. Should I private label a product or custom formulate my own?Starting your own supplement line can be a very lucrative business when done right, and when done wrongly, it could also be a nightmare or an outright disaster. In the world of business, due diligence has its place, and the same goes for the supplement industry. To be able to succeed in this business, you must have an effective marketing strategy. In business, the choice of product will determine to a large extent, the structure, profit potential and expandability of that business. Therefore when going into the supplement business, the decision to either develop your own unique blend or to use private label manufacturing services can have a huge impact on the nature and profitability of the business you are about to venture into. In this article, we will look at the pros and cons of both using private labels and developing your own blend, so that in the end, you will be able to develop a solid marketing strategy that will guarantee your success in the supplement business. Private label products are products that are developed and manufactured by companies who then sell them to other companies so that they can market them with any brand they choose. Private label supplement manufacturers usually have pre-made formulas that are already tested and ready to be manufactured and marketed, all the client needs to do is to provide his or her own brand-labeling and may also sometimes make slight changes in the overall packaging. Once you formulate your own blend, you will now be engaging in standard contract manufacturing and the rules, risks and opportunities will be different. Your marketing strategy of whether to sell generic and fairly priced products or to market premium formulas that command higher prices will determine if you should go the private label route or formulate your own blend. Also, if you are interested in formulating your own blend, but don’t know where to start, you can either buy a book on the subject of supplement development or look up many decent formulas online which you can then tweak to perfection. The following paragraphs contain more points you should consider before you reach a decision. Private label contracting saves you time because the formulas are already tried and tested. All the manufacturer needs is an order from you to start the production. No tests or tweaking of the formula is necessary. Using private label is cheaper because there is not much extra work to do, everything is simply ready. Moreover a good manufacturer can be able to keep manufacturing prices low since its a familiar manufacturing process as opposed to having to make adjustments for a unique formula. Private labels mean less work for you. No formula development or testing is necessary, all you have to do is find a reliable private label manufacturer. The products have usually been tested and found to be good. Although private label products are usually generic, they are also normally good without much customer complaint. So you should be sure of something good, but just not extra-ordinary. Private label products are usually generic and offer nothing much extra. Although there are few premium quality private label products, the majority are simply generic. The quality of the products and the level of success attained with them will depend heavily on the manufacturer. This is because only a good and experienced manufacturer can provide tested and good formulas, avoid the use of unapproved ingredients and follow the cGMP—current Good Manufacturing Practices—for supplements. A custom formula gives you the possibility of utilizing a premium pricing strategy in your marketing. With a generic private label product, you will not have any edge to request higher prices, but with a custom formula, your product may contain ingredients or features that are lacking in generic products and based on the fact that your product is providing a certain extra value that generic products do not provide, it can now command higher prices and still be popular. A custom recipe has the ability of becoming quite popular and gaining devoted fans if it strikes a chord with consumers. There is unfortunately no scientific method of determining “if” and “how” this can occur, but marketing data suggests that it is more likely to happen with a unique product than with a generic one. Once you have developed a recipe that you want to start marketing, that recipe becomes your intellectual property, and you have the ability to protect it in case of a future commercial success. Formulating your own supplement blend requires more time than using the readily available formulas from private label manufacturers. This delays your process of bringing a product into the market. The production costs of a custom formula supplement are not pre-determined like with a private label. You must have to present a contract manufacturer with a list of ingredients before you can get a price quote for the production run. Also, if you are only good at marketing but you are not a very scientific type and therefore have problems with formulating your own blend, you may also have to hire an expert, which simply means more costs. You will probably have to sign an NDA with the manufacturer so that your recipe is protected. But do note that if the manufacturer has to make changes to the recipe like making tweaks to the recipe or scaling up to a larger batch in order to use their large manufacturing equipment, then they own those changes to your formula, and you will have to negotiate a purchase from them if you want ownership. Since the formula is yours, testing your product to make sure it works is your responsibility. Whichever way you choose to go will depend in the end on your preferred marketing strategy. The choice is yours to make, and it will also depend on the amount of cash and time you have available. Whichever option you choose, the following are a few tips to keep in mind when venturing into the dietary supplement industry. – Make sure you choose a good and if possible, experienced manufacturer who observes the cGMP in manufacturing operations for Dietary Supplements. – Only work with a minimum order you can comfortably afford. – Whenever possible, always make your product stand-out and unique. – Study and understand the requirements of government regulators. – Keep up to date in your industry. – Consider a business- and a product liability insurance. – As long as you have a good product, advertise relentlessly. 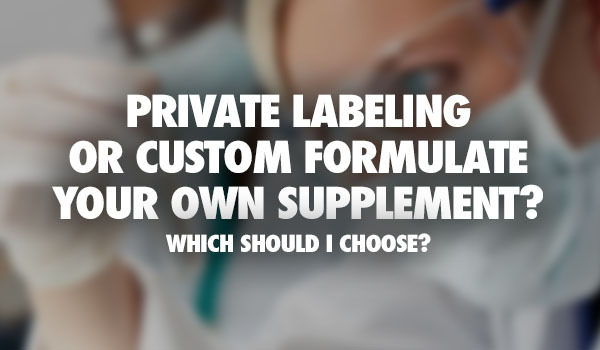 Are you interested in private labeling or custom formulating your own line of supplements? We can help! Give us a call today at (888) 682-2731 or contact us here. Our team of experts will help direct you in the right direction and answer all of your questions on which is best for your business. 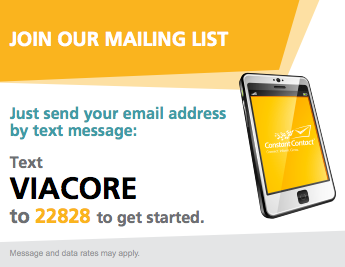 Viacore Nutrition has over 25+ years in manufacturing custom and private labeled supplements. We can offer free advice and assist you with the best options for your business.